W.E. Oates claims to have invented the term workaholism in his 1971 book, Confessions of a Workaholic, when he defined it as an ‘addiction to work, the compulsion or the uncontrollable need to work incessantly’. But though it seems a recent phenomenon, brought about by the relentless pace of modern civilisation, in reality workaholics have always existed. Go back to Roman times and Pliny the Elder, the famous writer and statesman, was starting his working day at midnight and having books read to him at mealtimes so that he didn’t have to stop working. Undeniably, it has become a serious cause for concern into the 21st century, and British workers are generally thought to be the longest-working employees. The macho culture of the City has had a vast effect on the hours people work, as has globalisation. The freedom the internet provides ironically binds people more closely to their work, as they can access it at home after hours. 10 percent of Britons could now be deemed workaholics purely by dint of the hours they work. How do you know if you’re one of them? 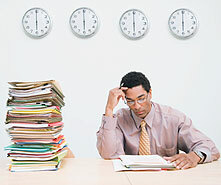 There are certain common symptoms that denote the workaholic. Those who have let work take over to an unhealthy extent often find it difficult to hold a conversation about anything else, and this can put strain on their personal relationships; friends and spouses are often the first to notice, but the sufferers themselves are blinded to the problem. Workaholics rationalise taking on more and more tasks. They also tend to find it difficult to relax, skimp on leisure time and see themselves trapped in the role of provider. The need to be seen as indispensable contributes greatly to this condition. Dr Gayle Porter, of Rutgers University School of Business, says of workaholics, ‘They overwork to compensate for self-esteem, self-concept and identity issues. This plays out as a sacrifice of intimacy, a high need to control, inflexibility and perfectionism.’ Her words describe a personality, often named ‘Type A’ by psychologists, whose characteristics include a preference to work alone, an inability to delegate and a habit of talking fast and interrupting people. If you are a ‘Type A’ person, you need to be careful as you are probably predisposed to overworking. ‘Workaholic’ used to be for many an implied compliment; now it is acknowledged that this addiction can wreak havoc on marriages, families, and personal health. A report by the Chartered Institute of Personnel and Development in March 2001 found that those who worked more than 48 hours a week risked domestic arguments and felt guilty about spending too little time with their children. Beating the need to work all hours can be tough – in the US Workaholics Anonymous groups have begun to blossom involving the same 12 step program used by the AA. In Britain, there is still a tacit acceptance of overwork and for that reason the individual needs great strength to break the habit. Psychologists like Robert J. Filewich, of the Center for Behavior Therapy, N.Y., suggest taking small steps, such as making time to relax in the evenings, or a concerted effort to see more of family and friends. Bigger moves involve learning – or simply allowing oneself – to delegate, and a change of perspective to focus on results rather than hours spent at the office.